Hollywood has long been responsible for the idea that blonde women are the definition of beautiful. From Marilyn Monroe to Alfred Hitchcock's favorite actresses to the countless number of fair-haired starlets that enter Los Angeles every day, the industry has long promoted women with flaxen locks. Eva Green, however, is brunette and proud. Green has long rocked the great combination of dark hair and dark eyes, and that look has propelled her career to the point where she's considered one of the finest young actresses working in films today. That changes in Tim Burton's Dark Shadows. Set to play Angelique Bouchard in the upcoming horror/drama, Green has apparently changed her style to match the look of Lara Parker, who played the same role in the 1960s soap opera. And surprise, surprise she still looks like a stunner. The new image comes courtesy of Spanish website Luces Camara y Blog and you can check it out below. 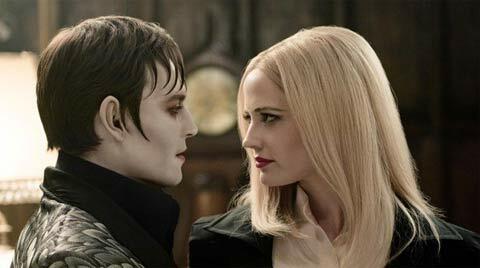 Also starring Johnny Depp, Michelle Pfeiffer, Jonny Lee Miller, Chloe Moretz, Helena Bonham Carter and Christopher Lee, Dark Shadows tells the story of man named Barnabas Collins (Depp) who breaks the heart of the lovely Angelique, who happens to be a witch. Wanting to see him suffer, Angelique curses Barnabas and turns him into a vampire and buries him alive. After emerging centuries later in 1972, he enters a world that has changed greatly, particularly for the Collins clan. The movie is due out on May 11 and you can see more from the title in our Blend Film Database.